Most unfortunately for me, I was in meetings at work all day while the SWTOR Guild Summit was in progress, without even time to check the twitter feed, except at lunch, to see what nuggets of information about the next big content patch were shared. But thanks to the many attendees who liveblogged from the event itself or while watching the livestream, I was able to get caught up pretty quickly. Starting today, and only for a few weeks it looks like, SWTOR players can invite three (3) of their friends to take part in a 7-day trial of the game. During this trial period, invited players can explore each of the four Origin Worlds. This is one of those much debated issues, and I’m glad with where they landed on this. The group finder feature will be introduced in the 1.3 game update, and will be limited to your server. This makes me incredibly happy. Yes, expanding a group finder to a larger server pool would mean potentially shorter queue times, but having played WoW with both server-only and wider population looking for group tools, I can emphatically say I preferred the ability to get to know folks on my own server (and the inherent accountability for behavior) that went along with the server-only looking for group. Completing Chapters in your class story unlocking abilities across your characters. Example of unlocking Force Choke on all your characters after completing Chapter 3 on your Sith Warrior. Jetpacks for Bounty Hunter, other classes receive rocket boots for a short duration sprint type ability. Sprint moved to level 1. I am buying this for every alt. EVERY alt! Mailboxes and the Galactic Trade Network on ships, so you need never return to the fleet again. When character transfers come, the higher of the two legacies will take priorities, which means you won’t lose out on your high level legacy by transferring to a new server. Ship droids will sell a voice restraining-bolt for certain mouthy ship droids. All these unlocks and rewards are retroactive, i.e. when the patch hits, your existing characters will automatically have access to all of this. you won’t miss out by having already leveled to 50. Guild Banks coming in 1.2, with up to seven tabs available. Future patches to include a Guild calendar and some sort of “guild advertising” to help guilds recruit new members. For full coverage of the event, head over to Darth Hater. But sprint at level one and guild banks are also so very welcome! I see a considerable purge happening in my character list. Also, must decide what to do about the now needing both factions on my main server (and my alt server as well). Level 1 Sprint pretty well tops my personal list. It’s such a small thing, but so fantastically huge for an altoholic. I’m excited for a fair portion of the Legacy stuff, though the completionist in me realizes that in order to unlock all of the options even for just character creation I’m going to have to level a lot of characters to max level, which then only unlocks one race or class ability (and gives some buffs). And unlocking all of those combinations is going to make me want to level other combinations, which means I’m going to have to delete characters to make room, or transfer characters to another server to maintain my Legacy, and then roll new characters there. I’m looking forward to LFG as well. I know a lot of people hate it, and don’t want to see it at all, but I’m not one of them. 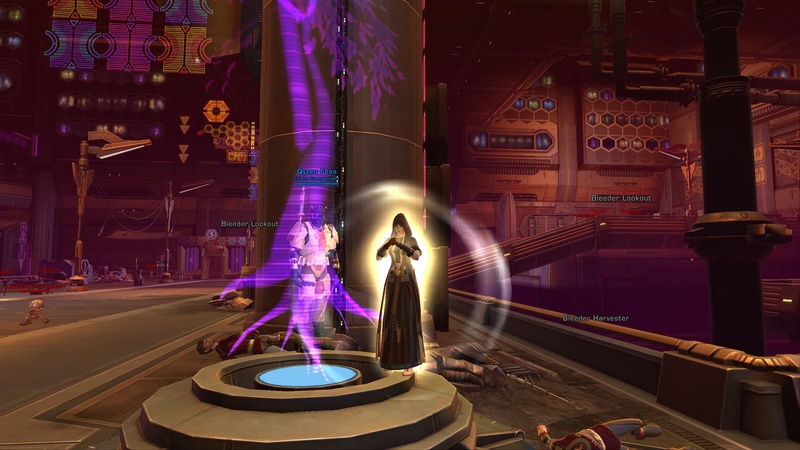 I had a fantastic time with LFG in WoW, and I’m really looking forward to it in SWTOR as well. I like that they’re trying to keep it to the server at first, but I’m completely open to cross server as well. In the end, people who want to be dicks are going to be dicks no matter what kind of accountability you try to apply to them. It’s not like you having a bad experience with someone is going to convince the entire server population to never do anything with them. Will it dissuade some people from being dicks? Sure, but the problem is always going to exist any time you include someone that’s outside of your influential social circles. Unless you’re a major figure in the server community, the majority of the server population isn’t going to care or listen to your report that Isappedurmom is a loot ninja or that he caused a wipe in your raid. I was happy with pretty much everything that they mentioned. Some things don’t really impact me at all since I’m not raiding and don’t have a desire to do so, but most of it was really positive. The only thing that turned me off at all was the guy who suggested repair costs for PvP as it was completely out of nowhere and makes no sense at all to be coming from a player as a request to the developers. The only thing I could come up with that would cause that to make any amount of sense, is that the guy isn’t good at earning/keeping credits, has had some bad PvP experiences, and feels that repair costs that could bankrupt him is incentive enough to drive away bad players. Bad idea all around. As Fynralyl mentioned, with Legacy bonuses also (potentially) requiring characters from both factions to unlock it completely screws my leveling/server plans. If they were to increase characters slots then it wouldn’t be a problem, but they also confirmed that they have no plans to do that. That potential does have me worried as well. While there are only 8 classes in the game, which are fairly well mirrored overall, they aren’t really perfect mirrors which means I need to be able to experience all 16 of the variations to really get a feel for them. Having only 8 character slots but a need for both factions on the same server really screws that idea. I’m going to be a downer and point out that dedicated minmaxers will have to level a helluva lot of toons to unlock their abilities for other toons. I hope those abilities will share cooldowns or something so I won’t feel required to level one of every class to access abilities. Having gotten un-trapped at work I see this is not as crazy as I thought. Feel free to ignore the crazy girl. Something I can only use every 20 mins with my companion out is a last gap cooldown or a fun toy. 🙂 Or maybe both.